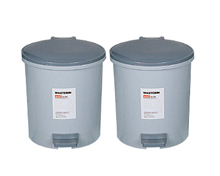 A waste bin, or a waste container, is designed to store waste, which is usually made out of plastic. Our waste bin is equipped with a cover to help create a tidy screen for your waste, and you can easily open the cover by your foot. Don't ignore the function of a small waste bin, as it can encourage people to avoid littering, thus creating an healthy and pleasant social environment. As an ISO9001:2000 and ISO14001:2004 certified waste bin manufacturer in China, we at Deli Stationery have been engaged in the production of office supplies for over 20 years. In order to ensure customers find the product they require, we provide an extensive line of office supplies, including file holder, stapler, pencil sharpener, whiteboard, fax paper, calculator, and more. As these products are quality built, environment friendly, and competitive priced, they are very popular with customers in the USA, Canada, Australia, Russia, Britain, Germany, Italy, France, etc. If you are in search of office supplies, please feel free contact us. We look forward to working with you!